When an iconic vehicle zooms along the road, people of all ages stop and turn their heads. Amazing feats of innovation and engineering, these cultural treasures are not just stylish and powerful, they’re irresistible symbols of status, freedom, and progress. 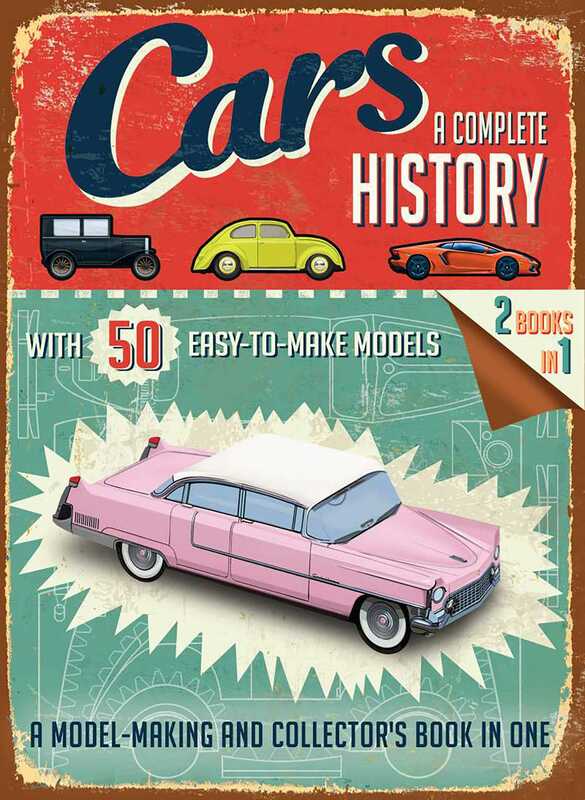 Now Cars: A Complete History puts that sense of “engine-uity” back into the collector’s hands by providing fifty press-out models of the world’s most distinguished vehicles, along with an informative and entertaining account of each car’s role in automobile history in a fun and imaginative two-part book. Enjoy photos and illustrations of cars, both classic and modern, along with the celebrities who brought some of them their fame, including Al Capone and the Duesenberg Model J, Sean Connery’s James Bond in the Aston Martin DB5, or Steve McQueen with the Ford Mustang Mark 1 in Bullitt. From social and cultural history to the advancement of technological innovation, you’ll learn everything from who drove the 1959 Austin Mini to which car prompted the introduction of a national speed limit. Cars: A Complete History will have auto enthusiasts young and old racing to assemble models and fuel their minds with information.